This twin-turreted, Napoleon III chateau, set conveniently close to the Normandy coast, ferry ports and magical Mont St Michel, has recently been voted amongst the top family friendly hotels in France by the Daily Telegraph and Sunday Times thanks to its family-friendly multiple-room suites, abundance of facilities and summer child-care inclusive weeks. Owner, Jon Barnsely, is a former national newspaper travel editor and, having sampled some of the best accommodation the world has to offer, he's poured his experience into making Le Castel something very special too, whilst focusing on filling the gap for a family-friendly chic chateau in Normandy. Jon began offering his dedicated children's suppers a few years ago and they became an instant hit with parents who lap up the opportunity to not to have plan each evening's meal, let their little ones eat sociably and enjoy a catch-up and a glass of wine with other grown-ups all at the same time, especially when it means they can also enjoy their own 5-course candlelit dinner, baby monitor at the ready, later in the evening. 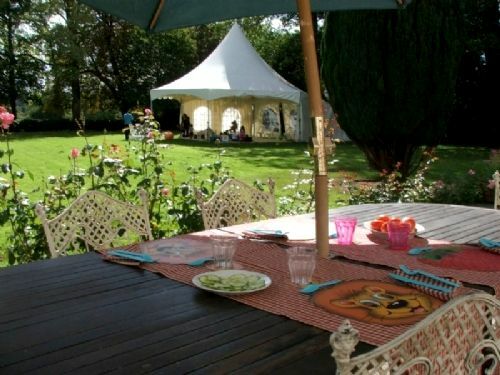 This year, he's introduced Normandy's first luxury all inclusive family holidays (running from early July until mid September) with discounted ferry crossings, stress-free onsite dining, childcare and essential caboodle such as cots, high chairs, baby bowls, sterilizer, monitors, baby baths and changing mats, all included. La Castel is set in four acres of parkland, featuring swings, a sandpit and woodland den where youngsters’ imagination can run wild. An array of bikes is available and children can delve into a box of balls, bats and frisbees found on the terrace. During the summer months, the swimming pool is always a winner and a Camelot-style marquee kitted out with toys and games, provides essential shade. Inside the chateau the library provides a welcome refuge for unwelcome rainy days, with UK TV and children’s channels, DVDs, a computer and games. There’s also free wi fi throughout the chateau and grounds. 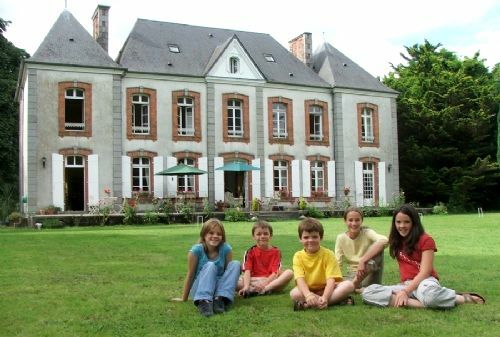 The two bedroom Dauphin Suite takes up the whole of the second floor of the chateau and sleeps up to two adults and four children. The Dauphin room has a king sized draped bed and besides being ensuite, has a clawfoot bath overlooking the grounds. The adjoining Joan of Arc room has three single beds plus a sofa that can be turned into a fourth bed, plus a large ensuite shower room. *All evening meals (except Thursdays), including children’s meals at 5pm most days followed by adult only suppers or dinner later. Lunches are not included. * Drinks, including wine by the glass, beer, soft beverages, juices, milk, water. * Free ice cream and lollies. Fruit, fromage frais, and yoghurts are also available. Bread and pastries are usually on the kitchen table...unless you have eaten them all at breakfast! 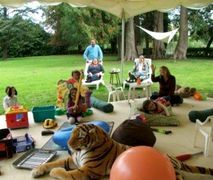 *Children's organised play sessions on some days so parents can either have a lie in or simply read a book in peace. Parents must remain on the premises, but you can put your feet up and relax! Children must generally be 3, but they often make exceptions to this rule if younger children are happy to join in the sessions. Sessions are usually run by a qualified nursery nurse, who is also a mum of young kids. Please note Xmas + NYE all inclusive stays do not include play sessions. Sandy beaches are just 20 minutes drive away. An outdoor swimming pool is open throughout the summer months. During all includive month ( July 2nd- September 10th) morning childcare is provided for 3-12 year olds during breakfast and most days from 4pm to 6pm, which includes activities and childrens dinner. At least 1 parent must remain onsite during these times. Baby bath, baby monitor, steriliser, potty, stair-gate in cottage, bed guards, plastic crockery, cutlery & sippy cups. Each family suite is equipped with a box of toys and books. In the library of the chateau guests will find UK TV and childrens channels, DVDs, a computer and games. 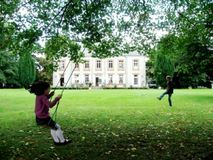 Children can run wild in Le Castels four acres of parkland, featuring swings, a sandpit and woodland den of gnarly trees, climbing branches and planks. An array of bikes is available and children can delve into a box of balls, bats and frisbees found on the terrace. 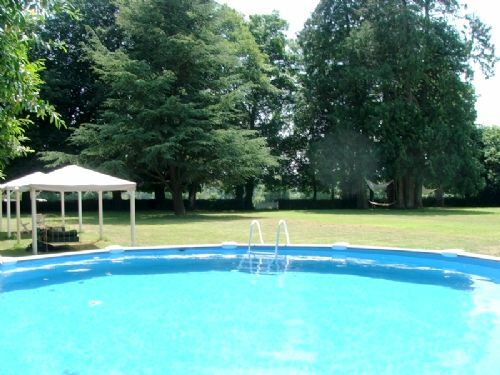 During the summer months, the swimming pool is always a winner and a Camelot-style marquee is kitted out with toys and games, including table tennis and table football. Early childrens meals are available between 5pm and 6pm. Table-dhote menus are also served most evenings by arrangement including a 5-course dinner with coffee from 45 Euros. Free wi fi throughout Le Chateau.